Although currently residing in Bremerton, Richard LeMieux says he lived on Bainbridge Island some years earlier. 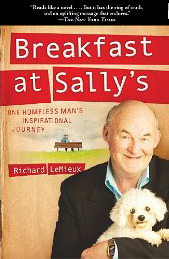 LeMieux is the author of Breakfast at Sally's: One Homeless Man's Inspirational Journey (2009), a book which has received both local and national attention. 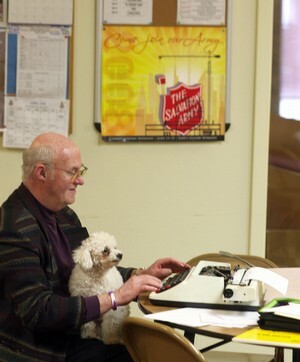 The autobiographical story chronicles LeMieux's years wandering the streets of Bremerton, sleeping in church parking lots, and finding warm food and acceptance at the local Salvation Army chapter. Athough the topic is not inherently cheerful LeMieux's is a story that is inspirational. Accompanied by his dog Willow he befriends a colorful cast of characters who, despite their flaws, are fundamentally lovable and challenge our stereotypical view of the homeless. David Pitt from Booklist says: "This really is a remarkable book, powerfully written, inspiring, heartbreakingly honest, and, somehow, frequently quite funny... a must-read story of homelessness, determination, and redemption." LeMieux is currently at work writing a children’s book about his dog Willow, who died of cancer in 2009. You can read more about LeMieux at http://www.kitsapsun.com/news/2008/apr/20/on-the-rise-from-a-deep-descent/#ixzz0u5DaqFnf.